All 3 bed rooms with attached toilets and hot and cold running water, air conditioning and fans, Modern kitchen and oriental kitchen with fire wood. Dining facilities inside and outside. Large living areas. On the terrace possible to make BBQ Large garden even to play cricket or children to run around. Hire a cook possible on request. Can walk to the beach direct from the house to Mahawella Beach. Safe to have a dip all around the year. Fresh fish available every mornings and afternoons. Safari: Within two hours drive you can reach to famous National Parks Udawalawa or Yala. You can make a day trip to Kataragama, Dondra, Matara or Mirissa Beach for surfing or relaxing. Blow Hole: Walking distance to famous Blow hole in Kudawella. For Bird watching Kalamatiya or Ranna beach for turtles landing to the beach reach within 30 min. Restaurants and hotels: Lot of restaurants on the beach or in Tangalle 7 km from Sethsiri Bungalow. Luxury villa Amanwella within 3 km you can go for a special meal and to see the view of the beach. Latest luxury hotel Anantara 5km away. If you are a couple you need only one room you can do so, other two rooms will be occupied by differnt partys. You can request the price for one room , depends the price on the time of the year. For the food you can use house menu or you can buy things and ask the care taker to cook. Payment for the cook you can negotiate. Its the house from the heritance. Its my pleasure to share my house with people looking for peace and quiet holidays. As it Is situated in idéal location for tourist. Can see the lot of history in the house and lot of places to visit around. Hot and cold water, mirror, facility to use shaver. 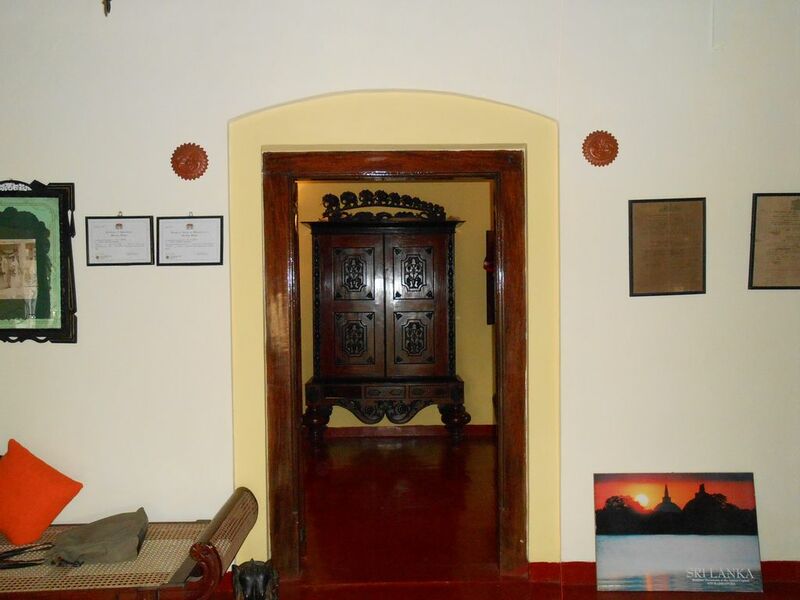 Nearly hundred years old colonial house renovated and added all the requirements need for comfortable holiday for a family or friends price is for the whole bungalow. good house for he price. We stayed 1 month with 2 small kids. ac working, kitchen well stocked with stuff. nice gardens with peacocks and monkeys. A short and nice walk to the beach. The caretaker is very nice although speaks little english. pool is small but deep! if you have kids. Ask the caretaker to clean it when is needs and he will. On the beach is a small restaurant we ate a lot, you need to put your order in erly! there is also a shop on the main road almost opposite the house, that sells veg and some fruit, they will buy for you if you need that can save you trip. For the price this house is absolutely fine and I and will use again. La maison est agréablement old fashion, immense et très bien équipée. Le jardin est paradisiaque avec la roue des paons tous les matins, les varans, les écureuils et autres animaux et oiseaux. Le house keaper est également parfait, pour les animaux et pour les conseils. La plage déserte au bout du chemin, à 100m est enfin parfaite. Les bémols (il en faut) : attention aux fourmis, le Wifi est concentré autour d'une unique table, un léger manque d'intimité car la maison du gardien donne sur la terrasse extérieure. Néanmoins, nous recommandons largement cette maison, havre de paix. We stayed about 10 days there for Christmas week. The old classic house is located very close to a very nice quiet beach. You have one or two "beach" restaurant there and also fishermen from which you can purchase delicious fresh fish. The caretaker is really helping and nice guy. 10 minutes away is the town. The garden is superb also. We spent a wonderful week there. Pool is really small but we spent all the time to the beach. Only wifi was working more or less. Recommended. Thank you very much for your comments, hope to see you once again some day! The property was very nice. I loved the traditional Sri Lankan feel of the home. There was large and beautiful garden filled with wildlife. We saw and heard peacocks daily. Each bedroom was air conditioned and had its own bathroom. The walk to the beach was about 200 yards away down a private path . There was a little "restaurant" at the beach, (really just a shack and a few tables with umbrellas) that served excellent Sri Lankan food. The beach was stunning and we had the oppurtunity to watch local fisherman haul in their catch. In the evening a local fisherman brought his catch to the house and we purchased a very large Searfish witch we bar-b-qued and it was delicious. The house help was very accommodating and gracious. I did have an unexpected and a bit scary surprise when a scorpian was found in my room. Especially since my twin 3 year boys were in there with me. I screamed and my husband and the caretaker arrived and rescued us by sweeping up the critter in a dustpan and putting him outside. Since then I've learned that wildlife is just part of Sri Lanka and it is everywhere. We really enjoyed everything about this bungalow. It was traditional, spacious, comfortable and well located. We would not hesitate to book it everytime we visit Sri Lanka. I highly recommend it. We were so happy staying in the bungalow. The gardens are so beautiful filled with palm trees, flowers, exotic birds, peacocks and a path leading directly onto a stunning beach. The bungalow is very spacious, very clean and well kept with everything you could possibly need for your stay. Piyadasa the caretaker/manager is a lovely man, so helpful and really looks after you. We will definitely recommend it to all our friends and hope to return one day soon. Riesiges altes Kolonialhaus in wunderschönem Garten! Wir (2 Familien mit jeweils einem Kind im Alter von ca 2 Jahren) verbrachten 7 wunderbare Tage in diesem wunderschönen Haus. Der Garten ist ein tropisches Paradies und man hat direkten Strandzugang. Wenn Gäste im Haus sind, lebt ein Caretaker (Sunil) mit auf dem Grundstück, so dass man bei Fragen oder Problemen immer einen Ansprechpartner hat. 3 bedroomed self catering villa with large living areas and separate area to watch satellite TV. All rooms with Air Conditioners and fans attached toilets with running hot and cold water. Modern kitchen and oriental kitchen with all amenities. On the terrace available seating and BBQ facility. Small pool to cool down. Out door shower. You can walk under the shades of coconut palms to direct to Mahawella beach where you can take a dip all year around. Also you can walk to the famous Blow Hole within 20 min. Lot of restaurants on the beach or you can find luxury hotels within 10 min drive. Fresh fish everyday on the beach. Large supermarkets, pharmacies in 7 km drive or Tuk Tuk. Local vegetable and fruits markets on sat, sun, wed. Fish market Daily. Less than two hours can reach famous wild life sanctuaries Yala or Udawalawa. Hambantota Harbour 1 h. Bird watching at kalamatiya or turtles landing on the beach at Ranna. Easy access from the main road even with public transport. If you are only two persons and you need only one room you can do so if house has no reservations, then you need to share the house with other persons. To find the price pls mail.